COLLEGE PARK, Md -- Scientists at the University of Maryland and Tulane University have developed a computational model of a swimming fish that is the first to address the interaction of both internal and external forces on locomotion. The interdisciplinary research team simulated how the fish's flexible body bends, depending on both the forces from the fluid moving around it as well as the muscles inside. Understanding these interactions, even in fish, will help design medical prosthetics for humans that work with the body's natural mechanics, rather than against them. This research is being published in the Proceedings of the National Academy of Sciences. "When a fish moves in a fluid, muscles contract, but the fluid also moves against the body. So, the amount the body moves depends on the internal muscle force and the external reaction of fluids," explained Eric D. Tytell, who conducted this research as a postdoctoral researcher in the laboratory of Professor Avis Cohen, Department of Biology and Institute for Systems Research. "Previous studies examined body mechanics separately from fluid mechanics because it is a very hard problem to solve. This is the first time that anyone has put together a computational framework to simulate this for large, fast animals like fishes. "The devices may one day help people regain control over their legs and walk again, Cohen said. "We understand to first order the neural circuit that controls the muscles for swimming or walking. Now, for neuroprosthetics, we need to understand how the muscles interact with the body and the environment - our model helps us do that. Take a lamprey and a barracuda as examples -- if you hold a freshly dead lamprey, it just drops, because it is a very floppy fish, Tytell explains. But if you take a fish like a barracuda, their bodies are stiffer and don't flop much. We wanted to know what difference does the floppy vs. stiff body make? If their muscles produced the same amount of force, then the floppy body, since it bends more, should accelerate more rapidly, but also expend more energy. And the stiff body should accelerate more slowly because it bends less, but once it gets going, it should use less energy. But in reality, this doesn't happen -- barracudas generally accelerate faster than lampreys. 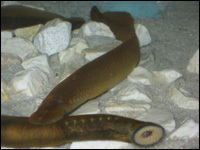 The simulations show that barracudas' muscles are probably stronger than lampreys', matched to the higher body stiffness. That may be why barracudas strike so quickly, Tytell said. "It is incredibly rewarding to work with biologists who embrace scientific computing as an essential facet of research, and to see that our simulations can address fundamental questions in physiology," Fauci said. "The simulations demonstrate that matching the mechanical properties of future prosthetic devices to the body's natural mechanics will be crucial. We'll have to get the mechanics right," Cohen said. Evolutionary biologists are interested in figuring out what the selective pressures were that led to a species having certain characteristics, and one of the things that it very important is locomotion. How animals move relates to their ability to find food, locate mates, and to escape predators," explained Tytell. "So this information is likely to have evolutionary importance in how fish evolved mechanically." "What difference does it make to be shaped like an eel or shaped like a trout?" Tytell says. "We understand pretty well the difference that shape makes for things like submarines that don't bend, but not so well for fishes." "The first line of defense against external perturbations such as eddies in the water for fishes, or tripping on a rock for humans, isn't the nervous system, but rather the body's mechanics, kind of like the shocks on a car. If we can translate the mechanical stability that living organisms exhibit into the design of robots or prosthetics, we could really advance the technology," Tytell said.